It’s a virtual camera that you can take pretend photos with. Try this tool and practice with all the settings to reinforce all you’ve learnt about gaining the perfect exposure. 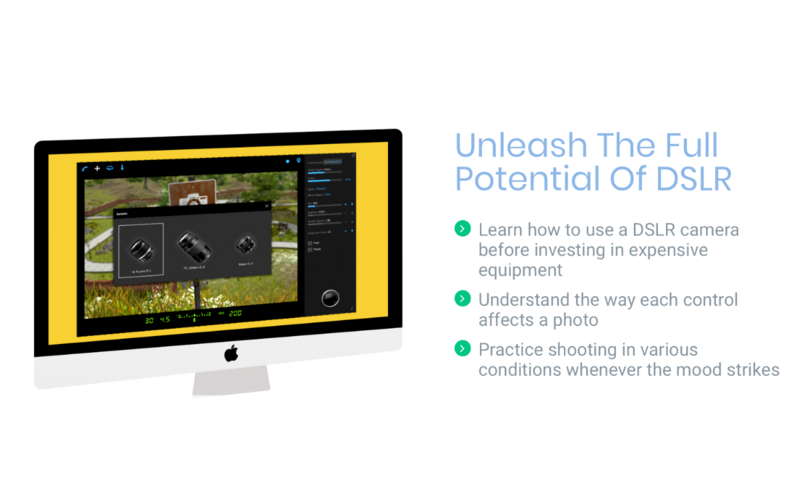 You’ll see the effects each setting has and explains visually how to use your camera settings. Go ahead… Experiment with the camera settings and instantly view the effects that each of the various settings will have on your results. Lighting is the single biggest determinant of how your camera needs to be set. With only a few exceptions, you can never have too much light. Use this slider to experiment with different indoor and outdoor lighting conditions. Moving this slider is the same as zooming in and out with your lens. A wide, zoomed out setting creates the greatest depth of field (more things are in focus) while zooming in creates a shallower depth-of-field (typically just the subject will be in focus). The exposure modes of an SLR let you control one setting while the camera automatically adjusts the others. In Shutter Priority mode, you to set the shutter speed while the camera sets the aperture/f-stop. In Aperture Priority mode, you set the aperture/f-stop while the camera sets the shutter speed. Manual mode is fully manual—you’re on your own! Refer to the camera’s light meter to help get the proper exposure. Although every real SLR camera has a “fully automatic” mode, there is not one here—what’s the fun in that? ISO refers to how sensitive the “film” will be to the incoming light when the picture is snapped. High ISO settings allow for faster shutter speeds in low light but introduce grain into the image. Low ISO settings produce the cleanest image but require lots of light. Generally, you will want to use the lowest ISO setting that your lighting will allow. Aperture, or f-stop, refers to how big the hole will be for the light to pass through when the shutter is open and the picture is snapped. Lower f numbers correspond with larger holes. The important thing to remember is this: the higher the f number, the more things in front of and behind the subject will be in focus, but the more light you will need. The lower the f number, the more things in front of and behind the subject will be out of focus, and the less light you will need. Shutter speed is how long the shutter needs to be open, allowing light into the camera, to properly expose the image. Fast shutter speeds allow you to “freeze” the action in a photo, but require lots of light. Slower shutter speeds allow for shooting with less light but can cause motion blur in the image. Now that you’ve tried the Camera Simulator…. …. on the next page there are a suite of similar and more advanced tools that will compliment your simulator experience and clarify your understanding of DSLR photography even further! With The Camera Simulator Pro Package, you’ll round out your photography education. To unleash the full potential of your camera, we recommend not just memorising the controls…. You really need to understand the ways each setting affects a photo. Camera Simulator Pro makes that easy !